Brett was left alone in the studio this week…. On this week’s episode, Harley and Brett fight through the pollen to visit Stewartstown, PA.
Brett had a great interview with Andrew D. Gable, author of The Mystery Animals of Pennsylvania. Andrew has a depth of knowledge about all things strange and spent his youth in Pennsylvania. We discuss Rehmeyer’s Hollow, which may be one of the strangest places we have ever covered on our show. 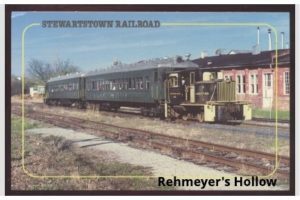 What is Rehmeyer’s Hollow or The Hex Hollow? Who do the Pennsylvania Dutch and witchcraft tie into the legend? What book is Andrew working on now? Stewartstown was originally claimed by both Maryland and Pennsylvania, and this dispute was not settled until the survey of the Mason–Dixon Line in 1767. If you are trying to find this sleepy little town, ask for directions to “the Maryland line” because unless you’re from Stewartstown, you’ve never heard of it. The Turkey Hill Experience is not booze, but a neat look into the inner workings of the culture of Turkey Hill Dairy….you get to milk a mechanical cow. Paesano’s in New Freedom is a pizzeria straight from the old country. We never thought of putting meatballs on a pizza, but this place has and we can’t wait to visit! Stick around for the outtakes….Harley has broken Brett’s muppeteer heart. We are considering changing the Top 5 to the Top 16….for reasons.